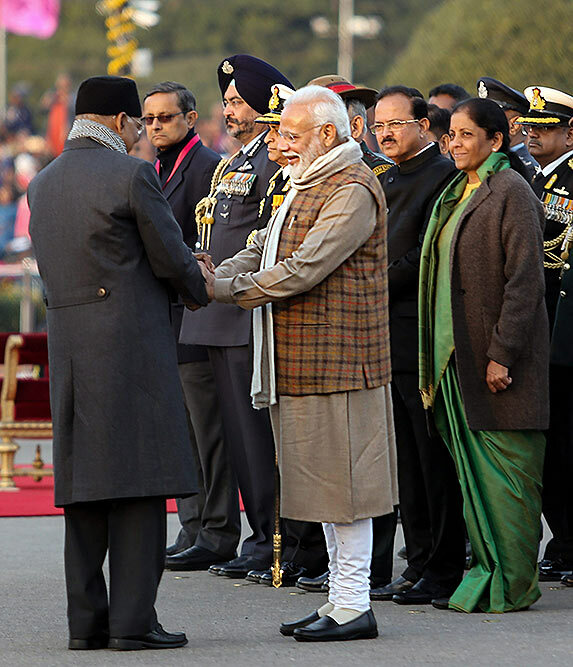 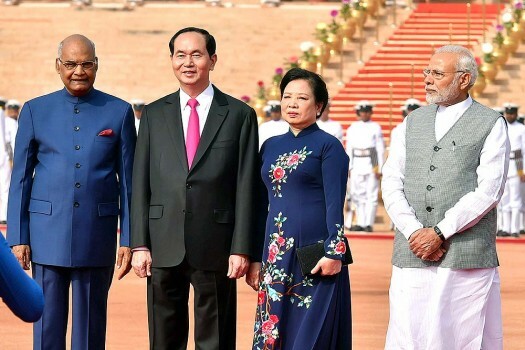 Prime Minister Narendra Modi welcomes President Ram Nath Kovind for the Beating Retreat ceremony at Vijay Chowk in New Delhi. 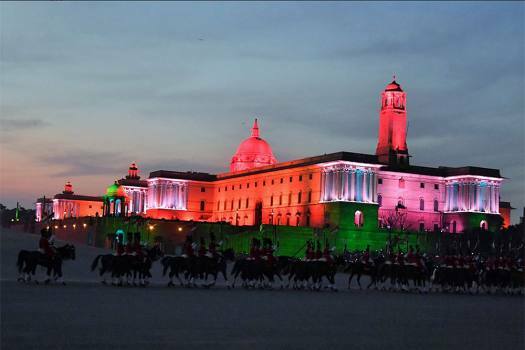 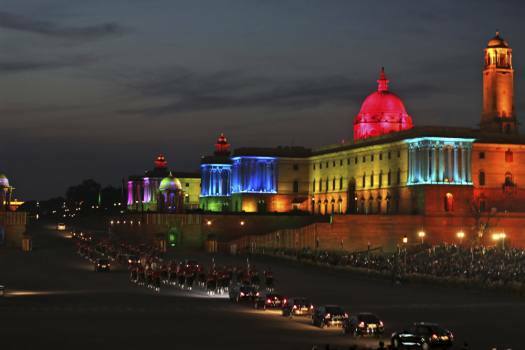 The Presidential Palace stands illuminated, at the end of the Beating Retreat ceremony at Raisina Hills, in New Delhi. 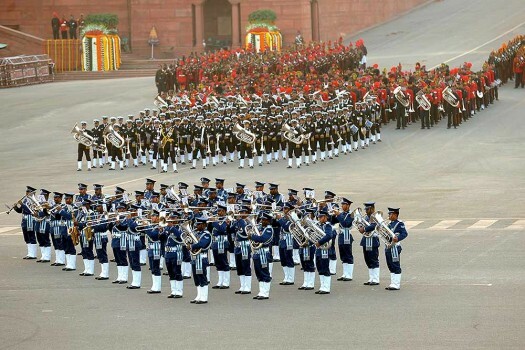 Military bands perform during the Beating Retreat ceremony at Raisina Hills, the government seat of power, in New Delhi. 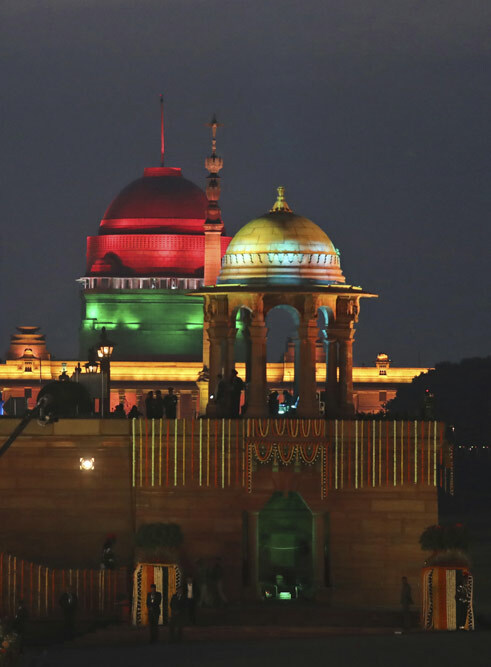 Presidential bodyguards salute as the national anthem plays during the Beating Retreat ceremony at Raisina hills, the government seat of power, in New Delhi. 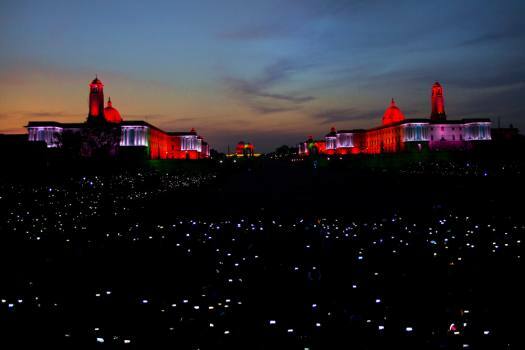 People wave thier mobile phones as their lights add to the beauty of the illuminated Raisina Hills, after the Beating Retreat ceremony at Vijay Chowk in New Delhi. 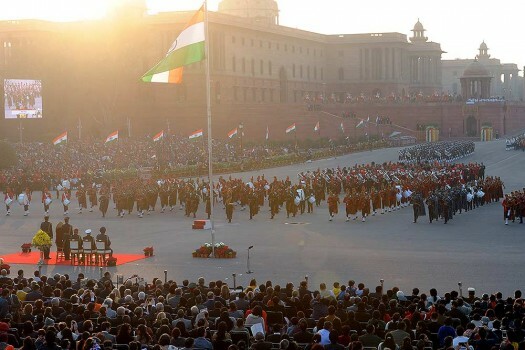 The national flag is unfurled as President Ram Nath Kovind and tri-services chiefs pay their salute during the Beating Retreat ceremony at Vijay Chowk in New Delhi. 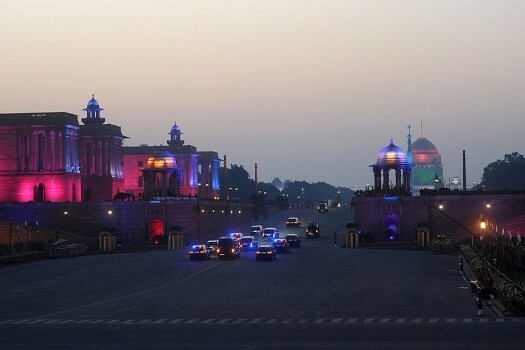 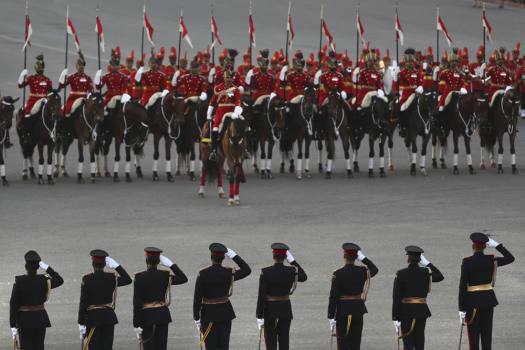 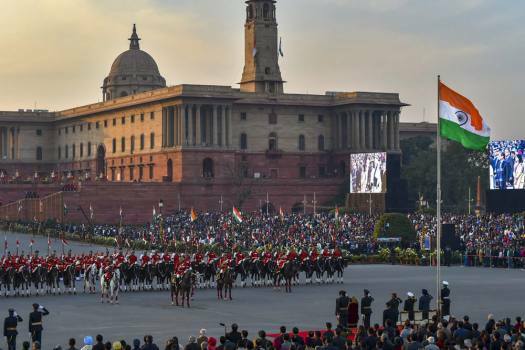 The car carrying the President, center escorted by horse-mounted presidential bodyguards, leave at the end of the Beating Retreat ceremony at Raisina Hills, in New Delhi. 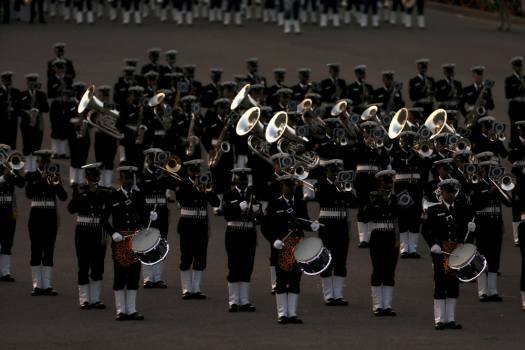 A military band performs during the Beating Retreat ceremony at Raisina hills, the government seat of power, in New Delhi. 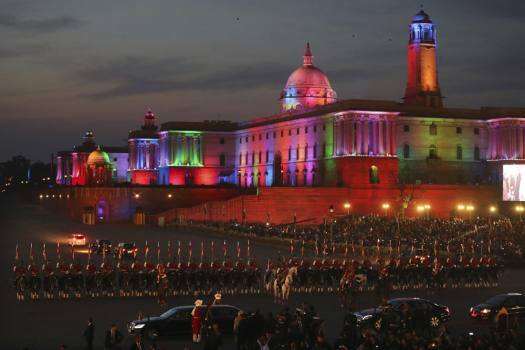 Military bands perform as the sun sets during the Beating Retreat ceremony at Raisina Hills, the government seat of power, in New Delhi. 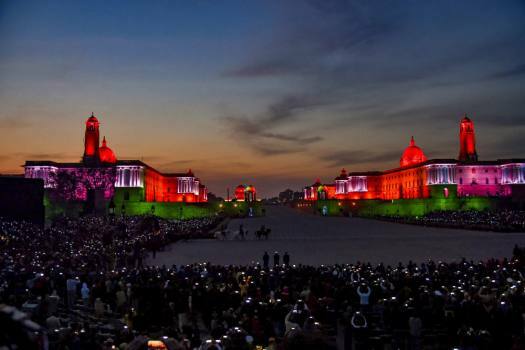 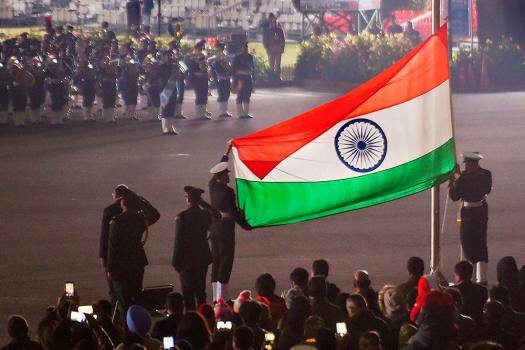 Soldiers fold the Tricolour after full dress rehearsal for the Beating Retreat ceremony at Vijay Chowk, in New Delhi. 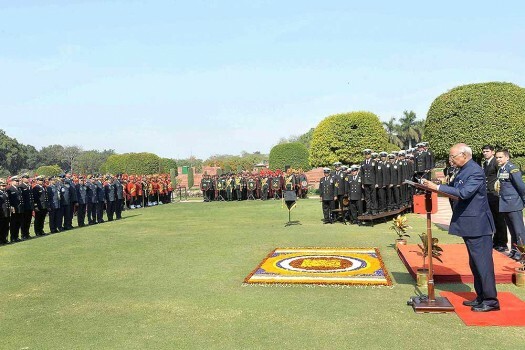 President Ram Nath Kovind meets 1100 Personnel of the Tri Service Band Contingents & 50 Provost Outrides of the Three Services at Rashtrapati Bhavan in New Delhi. 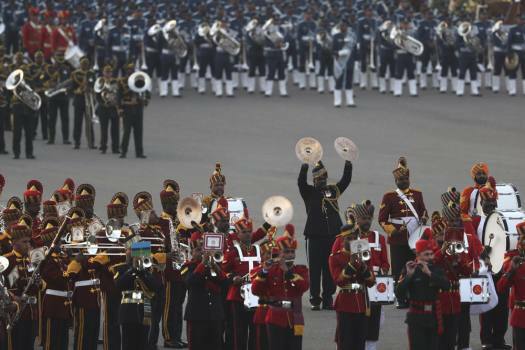 President leaves after the Beating Retreat ceremony at Vijay Chowk in New Delhi. 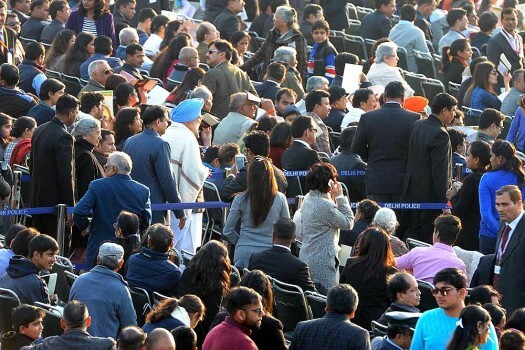 Former Prime Minister Manmohan Singh during the Beating Retreat ceremony at Vijay Chowk in New Delhi. 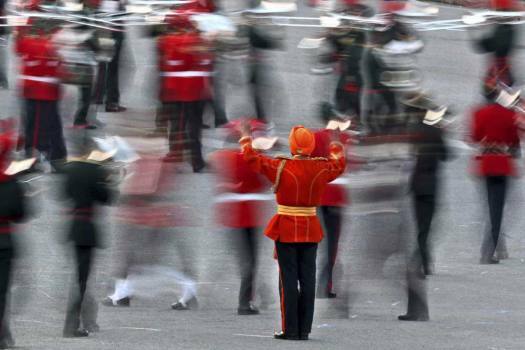 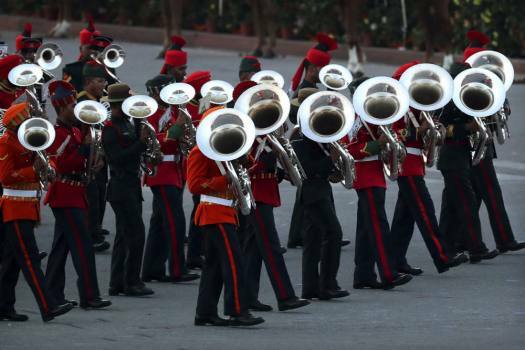 Tri-services bands perform at the Beating Retreat ceremony at Vijay Chowk in New Delhi.